No, I'm Not Talking to Myself: College football season has begun. Let's reminisce a little and then talk again in February. College football season has begun. Let's reminisce a little and then talk again in February. I love football. And just to be clear, for the purposes of today's blog, I am referring to American football...aka...the kind of football where only a couple of players actually use their foot on the ball. But whatever. Once again, I love football. I'll watch any kind. Pee Wee football, high school football, arena football, semi-pro, NFL...but my favorite football is college football. I grew up in West Texas, just 30 miles from Ratliff Stadium's "Friday Night Lights," so I thought I knew what big-time football and being a football fan was. And then I went to college. First Aggie football game. Sweaty, sunburned and loving every minute. This was before the days of the maroon outs, which is good because I probably would have had a heat stroke in maroon. 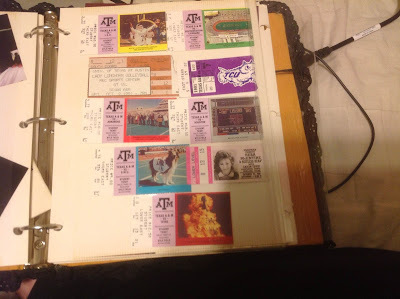 In case I haven't actually mentioned it before, I went to college at Texas A&M University back in the early-to-mid 1990s. Back then, the Southwest Conference still existed, and the Aggies were the biggest dogs in the yard. We won the conference my first three years there. It was such an electric atmosphere. I can still, very vividly, remember going to my first home game at Kyle Field. As freshmen, we had "the worst seats in the house" that were actually still pretty good seats. We could see everything...because we were on the third deck, with only three rows behind us...which means we were as high up as you could possibly get without being in the blimp that would occasionally fly over on game days. We were high enough up that there were birds flying BELOW us, which is kind of a trippy thing to experience. But it was awesome. I've never been part of something so BIG. It was humbling and empowering all at the same time. Around halftime, they flashed the game's attendance on the screen. 66,281. Twenty-two years have passed and I remember that number. 66,281. It was approximately SIX TIMES the population of my home town. That was hard for me to wrap my head around. Over the years I went to a bunch of football games and I still remember some of them specifically. (I only missed one home game in four years because at Midnight Yell the night before I "fell off Kyle Field" and broke my foot.) Of the games where my foot wasn't broken, some of them have some great stories. 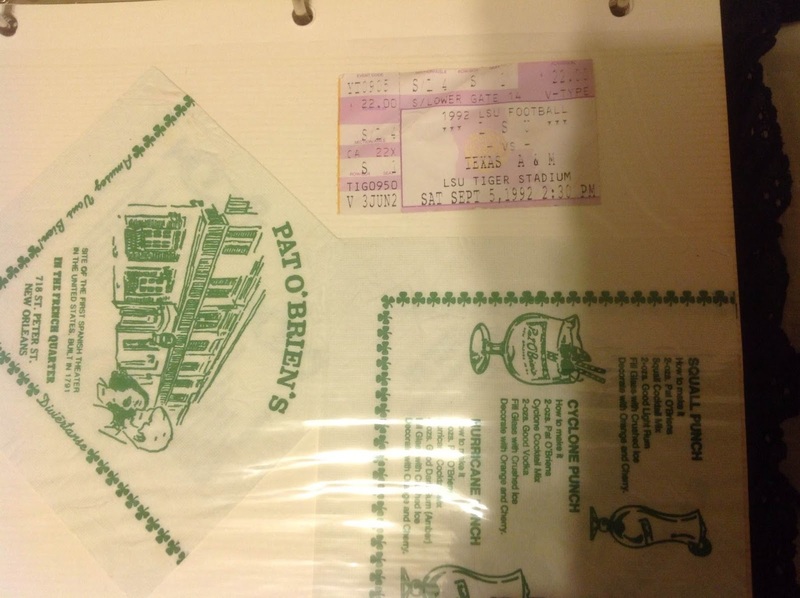 In fact, one game has such a great story that it will NEVER go on this blog because my parents read this. Texas A&M vs LSU. First stop: New Orleans. What happens on Bourbon Street, stays on Bourbon Street.. So, on to a family-friendly story. 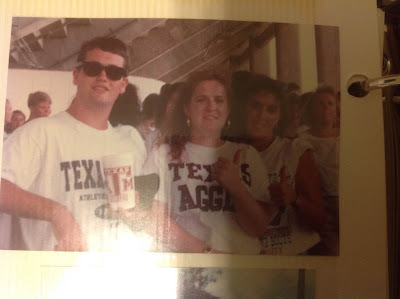 My freshman year, after going to all of the home games, my roommate Jennifer, her hometown friend Trey, Trey's weird roommate Dave and I all decided we were true Texas Aggie fans and as true fans we needed to support our Aggies at an away game. Pretty much the only away game left that wasn't too far to drive to was TCU in the first weekend of November (1991). We got our tickets, crammed Dave's nearly 7-foot-tall self into my little Cavalier and we hit the road. Now, just before we had left town that day, news of Freddie Mercury's death had broken on MTV. (That was when people still watched MTV for music and music news.) Dave was distraught. As a self-proclaimed "music-phile" (who said he loved ALL music, but refused to listen to country, the big hypocrite), Dave mourned Freddy Mercury's death all the way the TCU. If I had a dollar for every time he said, "I just can't believe he's DEAD," I could have bought him a bus ticket for the ride home. By the time we got to the Amon G. Carter stadium on the TCU campus, I was ready to tell him to "man up, there's no crying in football" or whatever, but instead I just made sure to sit on the other end from him so that I didn't say something mean. Or punch him in the throat. Before I get on to the game, I feel like I need to share something I learned on the drive there (beyond the names of every song written or co-written by Freddy Mercury). I learned that when you're in traffic and you really need to exit RIGHT NOW to get to the stadium, and you have a Texas A&M sticker in your window, other Aggies will slow down and let you exit. Or they'll be gracious and take turns letting other Aggies out when leaving a packed parking lot. This was eye-opening to me for two reasons: first, it was the realization (again) that "I'm part of something bigger than just myself." Second, it was the realization that this courtesy was only extended away from home. Back in College Station, the same person who just let me cut in because I missed my exit in Fort Worth wouldn't think twice about cutting me off at home trying to get to the Dixie Chicken. Now, back to the game. It was a blowout (the final score was something along the lines of 52-7). And it was cold. Like, windchill-factor-of-negative-nine cold. And then it started snowing. Almost everyone in the stadium left. But not us. Oh no. We were true fans. We just moved down closer to the field once all the seats started clearing out. We were literally right behind the team benches before it was all said and done. Now, being that close to the field in a practically empty stadium, we could hear almost everything that happens on the field...the play calls, the cursing, and the hits. A&M had a ginormous player on defense that year named Quentin Coryatt. And on a play towards the end of the game, he managed to sack the quarterback. But he didn't just pull him down. Oh no. He hit him. HARD. The sound of the hit in the almost-empty stadium was alot like a gunshot. That quarterback was down forever. When he finally came to, they carted him off the field. We found out later that Coryatt broke that quarterback's jaw with that hit. I'm glad I didn't know that at the time I heard the sound. It might have made me sick. Eventually, the second-longest football game of my life was finally over. (TTU vs LSU is the longest, but we don't talk about that one.) I guess the ride home from the game was uneventful. I don't remember much about it except being glad my car had a heater. These days when I watch college football, I do it from the comfort of my couch at home, or occasionally at a sports bar when I can talk my girl friends into watching with me. I don't have the patience for the heat or the people the way I used to, so I rarely go to the games. But no matter where I watch the game, or even which team I root for, it's still great being part of something bigger than myself.